Bring your pan to make sure your turkey will fit. Make sure the person picking up your turkeys knows the correct size. We don't mark each one with a name since we sell about 2,000 turkeys around the holidays. Our turkeys are fed a corn meal mash (no hormones of any kind). They are free range (not in cages)..you can see them from the road. We can split a larger turkey if you'd like two small ones or just a small half of a turkey (for the smaller families). You can buy extra parts of the turkey for gravy,etc. It is never too late to order, if you can't get through by phone, try email, or just stop by-we'll find something to fit your needs. We are open year round for chickens and eggs (if you call ahead, we can get you a turkey also). We recommend a pound to a 1 1/2 lbs. per person. Figure that there are bones in the turkey. The recommended size for a full, meaty turkey is 20 lbs. Ours range from 17-40 lbs. 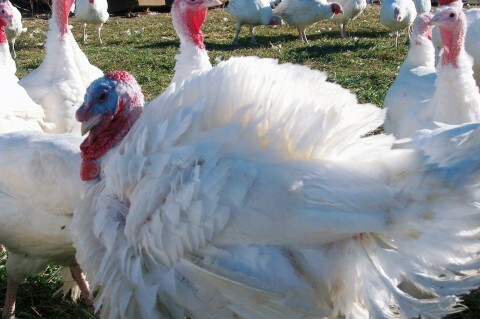 Generally our turkeys can be kept in the fridge for 3 days. If you want to keep it longer, put it in the freezer for a day or two to get a cold crust and then move it to the fridge. We also sell gift certificates. Your turkey isn't dead when you order, so know that we will try to get as close to your size as possible. We aren't considered organic. There are regulations, as well as a process that is needed to be evaluated as organic, but we consider our poultry to be natural- no hormones and free range. Have you ever wanted to come by the farm and buy some fresh eggs/chicken/turkey, but don't know where to go?? Well just look for the building marked Tewes Farm Store when you pull in our driveway and come in the green door. Copyright 2016 Tewes Farm. All rights reserved.